President & CEO Carmen Del Guercio guides the vision and leads the daily operation of the Maryland Food Bank. The son of Italian immigrant factory workers, Carmen always had enough food on the table — but as an adult he realized that his family, like so many others, were just one event away from food insecurity. After learning how widespread hunger in Maryland is, Carmen was compelled to help fulfill the food bank’s mission. With this in mind, he joined MFB in 2016 after a successful 29-year career in the banking industry. 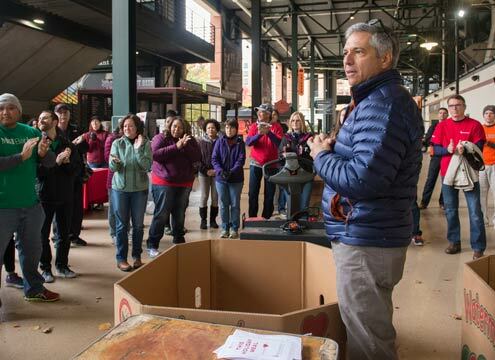 Today, Carmen is leading the food bank on an ambitious new movement that is not only feeding more people, but offering solutions that address the “root causes” of food insecurity. Outside of the office, you can find Carmen enjoying local sports teams, spending time with his wife and three grown daughters on Delmarva beaches, or traveling. Meg Kimmel, Executive Vice President of Programs and External Affairs, is the passionate, eternally optimistic presence behind the food bank’s marketing, programs, and fundraising teams. She keeps each team aligned with the food bank’s vision and strategy, while also tirelessly raising the organization’s visibility to the public. Meg has successfully built a fundraising program that celebrates donors and raises critical funds in support of the food bank’s ultimate goal to end hunger in Maryland. Inspired at an early age by her parents’ community activism, the desire to make a positive impact stuck with Meg as she gained international marketing exposure for companies like Mercedes-Benz, Benetton, and Teleflora over 20 years. Today, Meg puts her expertise to work for her home state with pride. In her free time, you can find Meg enjoying the NCR trail in Northern Baltimore County or texting her college-age children. Rick Condon, Senior Vice President of Operations, runs our vast food search and rescue operation that spans across three warehouses located in Baltimore, Salisbury, and Hagerstown. Leading 48 people, a fleet of 38 trucks, and overseeing the technology that makes the operation come together seamlessly — he works with our partner network to distribute more than 102,000 meals to hungry Marylanders every day. Rick has 25 years of supply chain and logistics experience and was drawn to MFB after an inspiring time volunteering at a hunger-relief organization in New York. Today, Rick and his team look forward to increasing our food operation to provide our neighbors in Maryland with increased access to healthy food. In warm weather, you can find him running the Across the Bay 10K or the Mission 10 Miler. Fay Nance, Chief Financial Officer, manages the food bank’s financial activities with the highest level of transparency and integrity. Since joining MFB, Fay and her team have transformed the food bank’s financial health by implementing best practices throughout the organization. Fay, a Certified Public Accountant, most recently served as the CFO and Treasurer for the Chesapeake Bay Foundation and has extensive experience managing capital and operating budgets, managing audits and investments, and refinancing debt while leading the development and implementation of financial software systems. When she’s not overseeing the financial affairs in the fight against hunger, she enjoys quality time with her loved ones, watching Premier League and Spanish League soccer games, rooting for the college soccer team that her daughter coaches, and cheering her son onto a successful career as an attorney. FoodWorks Executive Director Tim Regan was drawn to MFB after his first time volunteering in our warehouse. With a background in HR and extensive leadership experience, Tim is transforming our culinary training program and social enterprise. Today, FoodWorks not only graduates skilled chefs every 12 weeks, but also produces thousands of meals for food-insecure families every year. The FoodWorks culinary team also prepares hundreds of thousands of meals every year for kids in the MFB Summer and Supper Club programs. What’s more, the program now houses FoodWorks Catering — providing our culinary students with job-readiness skills while fueling the program with an alternative revenue stream. When Tim isn’t in the trenches fighting hunger, he can be found traveling rail trails around the mid-Atlantic on his bike or taking an adventurous trip with his wife. Vice President of Marketing Jami Dodson oversees the marketing team and is passionate about storytelling to effect positive change for Marylanders. With a creative eye and strategic mindset, Jami leads a team that creates integrated marketing campaigns to amplify MFB’s mission while strengthening a growing community of anti-hunger advocates. Before joining MFB in 2013, Jami worked as a designer and consultant in advertising and marketing. In her free time, you can catch Jami at the farmer’s market, reading a good book, or spending time outside. Laura Urban, Vice President of Philanthropy, leads the team that invites individuals, foundations, corporations, and government entities to support the food bank’s mission to end hunger. Laura is driven by the belief that access to nutritious food is a fundamental right for every Marylander. To date, she’s most proud of helping build a strong, dedicated team of hunger-fighting fundraising professionals. Before joining the food bank in 2013, Laura gained more than 20 years of experience writing and fundraising for environmental nonprofits in Chicago. When she’s not working to secure funding for a brighter, food-secure future, she enjoys any hobby that takes her away from a computer screen, including basket weaving. The above list of independent voting members is current as of 02/04/2019.